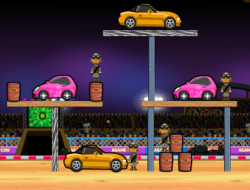 The annual demolition derby has now started and you will be the main attraction tonight. There are many structures placed in front of your car and you have to set up a ramp in such a way that it will launch your car into them and hopefully cause enough damage to all the dummies and the cars there. If you do a good job you will be awarded some stars which you can use to upgrade your car investing in speed, jump power and damage. Find out the best places to set your ramps and make sure to buy other cars when you afford them. Demolition Drive 2 0.00 between 0 and 10 based on 0 votes.